The PHP script is designed to be called from the command line. It has been updated to use v2 of the Abuse IP DB API. The script then check if the IP has already been reported by your account (lines 87-97). If the IP hasn’t been reported, a new report is created on AbuseIPDB (line 102). The above script only checks reports from the last day (line 88, maxAgeInDays=1). The verbose flag (line 88) is used in the API to return additional information on each report, including the AbuseIPDB User ID who created the report. This is used to make sure you don’t report the same IP more than once in 24 hour period. 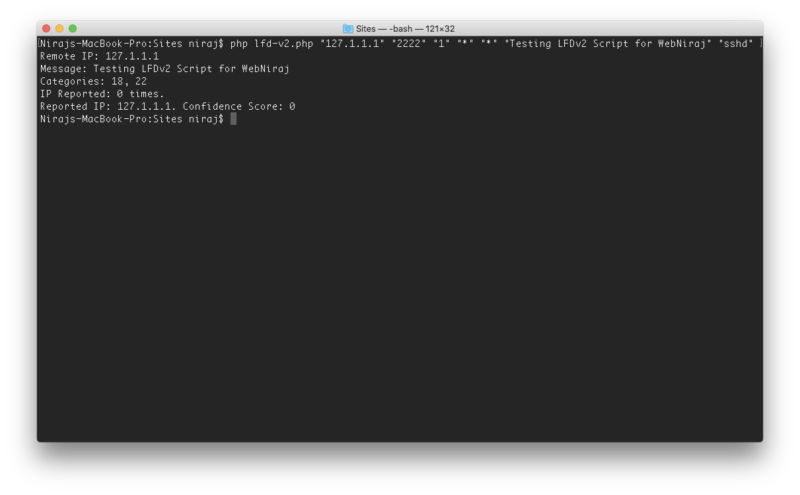 I stored the script in /root/lfd-v2.php and added the relevant execution permissions using chmod 755 lfd-v2.php. Thanks to line 1 in the above code, you can simply run lfd-v2.php in the command line and it will trigger the PHP code (without the need for the php prefix). Update the line so it reads: BLOCK_REPORT = "/root/lfd-v2.php"
/root/lfd-v2.php "REMOTE_IP" "PORTS" "1" "*" "*" "blocked REMOTE_IP for SSH brute force" "sshd"